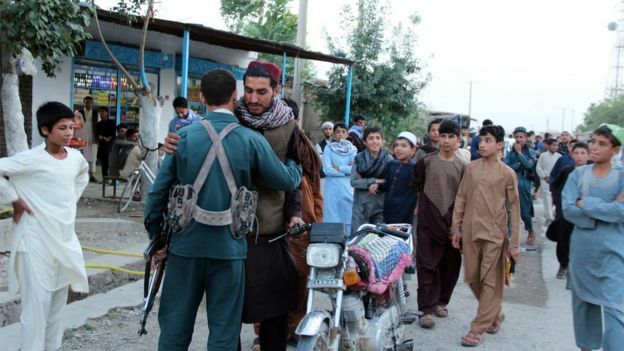 In scenes that would have seemed impossible a few days ago, members of the Afghan Taliban have been embracing Afghan security forces amid a three-day ceasefire called to mark Eid. Militants also met Interior Minister Wais Barmak in the capital Kabul. President Ashraf Ghani has extended the government’s ceasefire and called on the Taliban to do the same. However 20 people died in a suicide attack on one gathering of Taliban and government officials in Nangarhar. Taliban members and local residents were among the victims of the attack, carried out by a suicide attacker on foot, Nangarhar province spokesman Attaullah Khogyani told the BBC. President Ghani wants the ceasefire to lead to a longer peace and has called for the Taliban to negotiate. Earlier this month the Taliban denied that they were in secret talks with the Afghan government. Mr Ghani has also confirmed the death of the commander of the Pakistani Taliban, Maulana Fazlullah, in a US drone strike in Afghanistan on Thursday. For many Afghans these are extraordinary scenes. The two sides were fighting each other just a few days ago. The unprecedented development has raised hopes of permanent peace in the war ravaged country. Neighbouring Pakistan is considered key in starting the peace process as many Afghan Taliban leaders are believed to be living inside the country. However Islamabad accuses Kabul of harbouring Islamist insurgents who have carried out several violent attacks inside Pakistan in the past. But the killing in Afghanistan of Mullah Fazlullah, one of Pakistan’s most wanted militants, could address some of Islamabad’s security concerns. Tolo News posted video of a militant embracing an Afghan soldier in Kunduz in the north of the country. In Kabul itself, dozens of unarmed Taliban fighters entered to celebrate the unprecedented ceasefire. 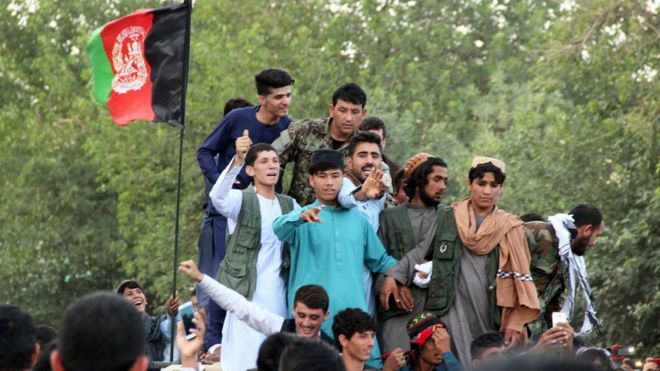 One Taliban member was pictured holding an Afghan flag on a bridge in the city as residents took selfies with him. In the second day of ceasefire, #Taliban with their flag get streets in #Kabul city and people are taking selfies with them. #KotaSangi #Kabul. Militants were also pictured with Mr Barmak. How did the ceasefire come about? The Taliban announced the three-day halt to hostilities earlier this month, days after a unilateral ceasefire lasting until Wednesday was ordered by the government. It is the Taliban’s first ceasefire since the government they ran was toppled by the 2001 US-led invasion. The US state department has said US forces and coalition partners would “honour the ceasefire”. President Ghani has now said the government ceasefire will be extended and has called on the Taliban to extend its ceasefire, which is due to end on Sunday. In February Mr Ghani offered peace talks “without preconditions” and recognition of the Taliban as a legitimate political group if they respected the rule of law. How have ordinary Afghans reacted? Residents have been expressing their surprise and delight. “I could not believe my eyes. I saw Taliban and police standing side by side and taking selfies,” Kunduz resident Mohammad Amir told Reuters. “It was the most peaceful Eid. For the first time we felt safe. It is hard to describe the joy,” said Qais Liwal, a student in Zabul in southern Afghanistan.